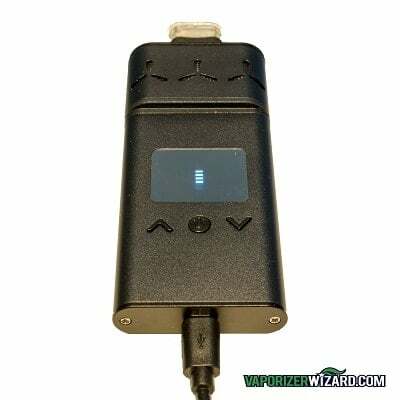 The AirVape XS is a portable conduction vaporizer made by Apollo. This is the second dry herb vaporizer out of Apollo and so far it’s a good unit especially for the overall size, price and the fact that it comes with a lifetime warranty. The XS comes with a large, easy to read digital display featuring a full temp spectrum, session length timer, current battery life, and on vape temp buttons. Did I mention that it’s almost as thin as your smartphone? You can pick up the AirVape XS ($149) here from my recommended authorized retailer or read on below to get my full AirVape XS review. The overall size of the Air Vape XS is the main selling point by far. It’s very slim which makes it one of the easiest vapes I own to pocket and also very easy to hold. I can’t quite completely palm it because of the height but it is shorter than the average smart phone. The outer shell is a brushed rugged finish and you don’t have to worry about it easily scratching. The only thing that could potentially break would be the glass mouthpiece at the top and it seems pretty durable. Lastly, the haptic feedback is a nice feature to remind you when the bowl is pre-heated and ready to go. With the Air Vape XS, you get a USB cable and wall charger. Extra screens, some cleaning tools, a faux-leather case (meh), the instruction manual and the unit itself. They also have a concentrate insert available for the unit but I haven’t had a chance to try it out yet. I will be sure to update this review when I have tested it out. Heating: Although the Air Vape XS claims to be a hybrid heating system, I would have to say that it leans more towards a full conduction system. I would also say the entire unit runs a bit hot. Temp 380 seemed more like 400 to 410 on the Crafty or Mighty so I tend to stick to the 350-360 range which ends up helping with overall battery life anyways. The AirVape XS uses a fully isolated air path, ceramic oven, glass mouthpiece, but a silicone gasket to connect the chamber and mouthpiece. I wish they could have used an all-glass vapor path somehow. The ceramic oven is sized well for 1 or 2 people holding roughly .15 grams of dry herbs. With a very fine grind and a tamp down it can hold a bit more. Temp Options: The full temp spectrum runs from 200F to 428F and will reach temps of 360F-400F in about 30-45 seconds. The heat up times are about average however a lot of new portable vaporizers are heating up in around 20 seconds. It also uses a three or five minute session timer. The pre-heat time cuts into your five minute session timer which really isn’t a big deal but now you’re starting a session with 4 1/2 minutes remaining. Again, you just have to turn it back on but it would have been nice if the timer started when the unit was fully pre-heated. Luckily the Airvape does a great job of vaping the full oven quickly and evenly so the short timer is generally not an issue. Vapor Quality: The first couple rips are great tasting with smooth vapor but drops off pretty quickly. Like I mentioned above, I would stick with the lower temps for best tasting sessions. 350F-370F seems to be a good range. The Air Vape XS does, however, have HUGE cloud potential. The higher temp sessions will definitely satisfy heavy hitters but don’t expect superior taste. I’d say anything above 400 and the taste pretty much goes out the window. Draw Resistance: Slightly below average draw resistance which is good. Meaning that is has less draw resistance than most other portables I’ve tested. A full chamber with a fine grind will produce the best results. My preferred loading style would be an average grind with a full but lose pack. A fine grind will provide the largest clouds but will clog the screen faster and need to be cleaned more often. Whereas a coarse grind will help stop the herbs from collecting on the screen. No need to stir! I’ve been getting even AVB with numerous loading styles including just straight throwing whole nugs in the chamber. I was very impressed by this. Sessions run hot. I suggest a slightly lower temp than your normal preference. For me 350-370 is my sweet spot bumping it up to 380+ to finish off the chamber. The routine maintenance is actually pretty minimal. I was thinking that the screen would clog pretty fast and increase draw resistance but I was able to get in 20 – five minute sessions before I needed to fully clean the screen, mouthpiece, and take a q-tip to the chamber. The entire cleaning process doesn’t take more than five minutes. You can just drop the silicone parts into some warm soapy water. The screens and glass mouthpiece can be soaked and cleaned with ISO. Neglecting to brush/blow out the bowl and screen after sessions could potentially increase the frequency of cleaning. But as long as you empty and brush out the chamber after your session you should be good. Be sure to rinse off all pieces and let them completely dry before using the unit again. Battery Specs: The Airvape XS uses a 1300 mah internal NON-replaceable battery which is a bit weak. They definitely had to use a smaller battery to get the thin styling but most other portables in today’s market will have 2500 mah or more. Avg Battery life: I’ve been averaging around 25-40 minutes on a fully charged battery. 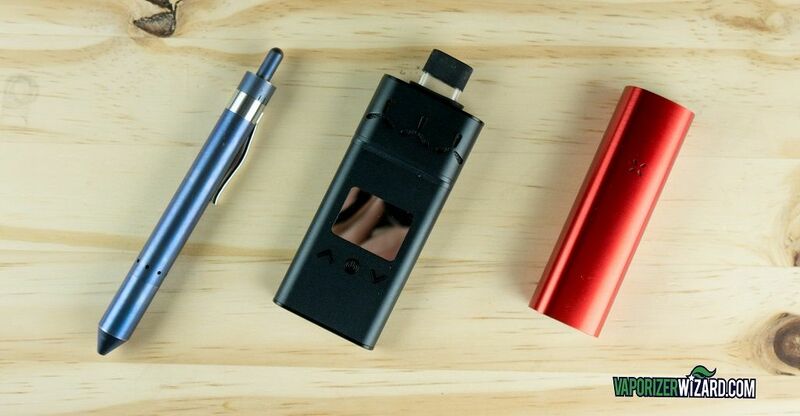 The overall battery life depends on the temps you vape at and whether you are vaping single five minute sessions or back to back sessions. It will take more battery power to heat a cold bowl vs vaping back to back sessions. Avg Charging Times: Typical charge times have averaged about 1 hour 20 minutes. Good news is that the unit does have pass-through charging so you can use it while it’s charging. I’ve been getting about 3-4 bowls on a full charge depending on what temps I’m vaping at and how large I packed the chamber. Charging Options: You can charge it via USB or use the included wall charger. The screen will display the battery level as it charges. Overall, the Air Vape XS leaves something to be desired in the battery department. If you’re looking for a portable unit with better battery life, I would check out the Pax 2 below. Pax 2 ($149) – If you’re looking for something durable, proven, and just as portable, I would check out the Pax 2. It doesn’t come with a digital display or a full temp spectrum, and the Airvape wins on clouds, but I prefer the vapor quality, both taste and temp much more on the Pax 2. You also get 90 minutes of battery life on the Pax 2 which is over double the Airvape XS and they both charge in 90-100 minutes. Last but not least, the Pax 2 comes with a 10-year warranty. 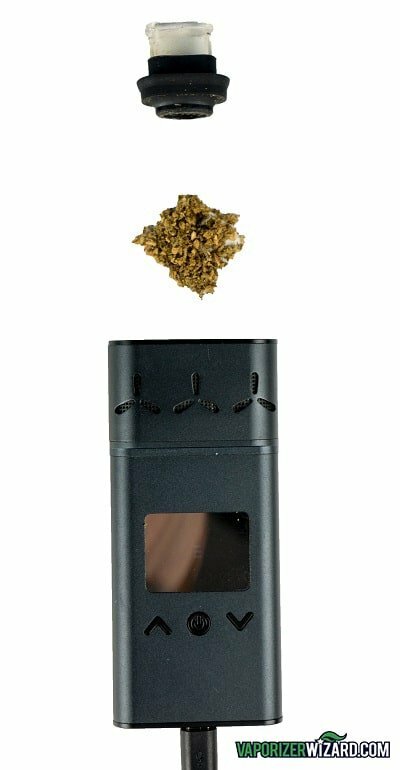 Grasshopper ($200) – The Grasshopper offers a replaceable battery system, full convection heating, a full temp spectrum, and a lifetime warranty. All while being the size of a pen. The biggest downside to the Grasshopper is that it is not the most reliable and a lot of users end up using their warranty. It also produces some hotter than average vapor because of the short vapor path. Mostly on higher temps. Overall the Air Vape XS is a great vaporizer for the size and price. I love that they offer a lifetime warranty, since very few other vapes have that. They also have an upgrade program. Existing registered customers are eligible for an upgrade on future models for a “fraction of the price.” They are definitely trying to take care of their customers. I’m not a big fan of the battery life but if you’re not a heavy user or won’t be using it for long periods without charging, the Air Vape XS could definitely work for you. Lower temps will produce the best tasting sessions and be sure to keep on top of the routine cleaning to avoid increased draw resistance. Click here to pick up the Air Vape XS from my recommended authorized retailer. They have fast, discreet shipping, and usually throw in a free gift. Thanks for checking out my site and reading my Air Vape XS vaporizer review. Let me know if you have any questions by leaving a comment down below or hitting me up on my contact page. Have a great day! I'm really diggin the size of the new Air Vape XS. I can easily pocket it for use on the go but don't buy this unit for the battery life. I've been averaging 3 maybe 4 bowls on a full charge and it takes roughly 80 minutes to fully charge. It does use pass-through charging and the fact that it comes with a lifetime warranty is a huge plus. 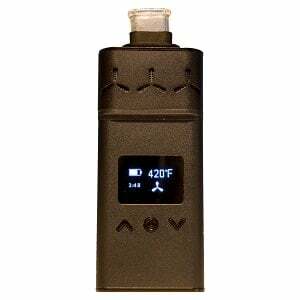 Overall this is a solid portable vaporizer for the price, specs, and warranty. please i want your opinion about the convection system of XS. You said “Although the Air Vape XS claims to be a hybrid heating system, I would have to say that it leans more towards a full conduction system”. But the conducting system does not provide direct contact with the resistor (incandescent coil) and therefore causes combustion? Do you think the ganja is in contact with the warm ceramic chamber can cause burning? At what temperature? Basically I would absolutely avoid combustion and XS is all that I would use in a portable vaporizer … so your opinion is fundamental to me and my choice. Thanks a lot, your review is really accurate. Definitely no combustion. NO contact with any part of the heater. No burning. It’s actually a very good vaporizer for conduction. I just heats the entire chamber instead of just passing air over the chamber. Let me know if you have any more questions! Sorry for the late reply. Will Airvape replace the entire unit when the battery eventually fails? Should I register my Airvape? The local vape bar clerk didn’t say anything about that and I don’t know if I have the receipt other than my cc statement. The 1300 mah battery concerns me because being new it works fine, but 2 years from now I wonder, and don’t really want to add a new $140 expense every two years on this product compared to others that might last longer. Otherwise I love the Airvape and am amazed how good the thing works, esp healthwise! I don’t think the battery is included with the warranty but I’m sure they will work with you if/when it needs to be replaced. I’m researching for a new vape. I’ve been using the davinci IQ after having the original davinci for a few years. I really like my IQ but lately have been having problems with it starting or powering on even with it on charge. How would you say the IQ compares to the Xs? Thank you. I think you’re better off contacting Davinci and see if they will fix it or replace it. I don’t think you would be satisfied with the vapor quality difference. The IQ is pretty cool smooth vapor but the Airvape XS is pretty warm. Let me know what they say or if I can help in any way. If you wanted something different I would check out the Boundless CFX or the Boundless CF. Both of these will have similar vapor quality and easy to use.